Currently the RedEye app for Android is limited to control of networked RedEye hardware — that is, RedEye (WiFi) and RedEye Pro. Although RedEye mini compatibility is a popular request, RedEye mini requires further research into the headphone jack on various Android handsets, as well as additional development using the Android NDK (Java code cannot keep up with RedEye mini’s real-time audio processing requirements). For now, configuring RedEye hardware (adding devices and activities, for example) requires an iOS device (iPhone, iPod touch, or iPad). There are some Android-specific issues that we are working through here, not least of which is the inability for non-rooted Android handsets to join ad-hoc WiFi networks. As a result, if you plan to participate in the Android beta, please make sure you have access to an iOS device for setup, and that you move your RedEye unit onto an infrastructure WiFi network. While the RedEye app is in beta release it will be available for download only from this page. Once we have a production version ready to go, we will also list the application on the Android Market. In order to use the app from this website, you need to enable installation from “non-Market” or “unknown sources.” To do this, open the main Android settings, select the Application section, and then make sure the “Unknown sources” box is checked. If you download directly onto your Android device, the application will install right away. Alternatively, you can download to a PC and then transfer to your Android device using a USB cable. Not all Android handsets are created alike, and these differences are one of the main reasons for the beta release. While we do as much testing as we can in-house, there are simply too many combinations of hardware and OS version for us to vet completely without your help. Again, our Android beta forum is a great place to go to share your findings and questions. In the meantime, we will also post key information here regarding compatibility. The RedEye Android app supports OS version 1.6 (Donut) and later, including 3.0 (Honeycomb). We have not yet tested v3.1. If you have one of these handsets, all is not lost — you can configure the RedEye app to find your hardware directly by IP address. After launching the application, tap on the Android settings button to enter the setup portion of the application. 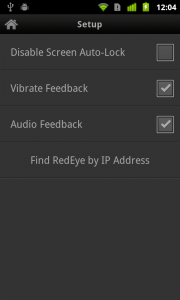 Then tap on “Find RedEye by IP Address” and provide your unit’s IP address and serial number. When using this method, we strongly recommend assigning a static IP address to your RedEye unit so that it does not change unexpectedly and thereby become unavailable within the app.